Providing the Finest New Mexico Vacations since 1998. For 20 wonderful years our vacation homes have been offering an authentic way for you to experience this fascinating and historic city. Our exclusive properties, local knowledge and legendary customer service will help you get the very best out of your trip to Santa Fe. We have a collection of over 50 exclusive Santa Fe vacation rentals, situated in the very best locations, including the down town Plaza area, the Rail Yard and Canyon Road. Many of our luxury vacation homes have spectacular mountain views and are only a stone’s throw from the Historic city center. Whether you want the beauty and heritage of an old adobe home, or you prefer a more contemporary style, we are confident we can help you find the perfect Santa Fe vacation rental. Browse Our Properties Homeowner? 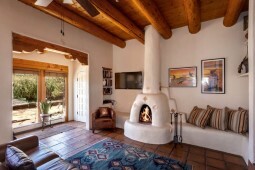 Find out why Santa Fe property owners trust us to manage their vacation rentals. Two Casitas is active on Airbnb, VRBO and all of the other major vacation home listings sites. HOWEVER, the best deal on a Santa Fe rental is always available directly from us. Find out more here. A magical journey awaits you as you explore what we affectionately call "the City Different"
When you plan an exclusive vacation with Two Casitas, whether you are looking for the top ten things to do in Santa Fe or the very best local tips customized to the interests of your party, we can help. Let us share our intimate knowledge of Santa Fe with you: The sights and sounds, renowned culinary flavors, diverse culture, arts and heritage, and of course, the natural beauty of the region. Come and visit Santa Fe for one of our many festivals: to name a few, Indian Market, Spanish Market, the Balloon Festival, The Wine and Chilli Festival. Take a day trip to Northern New Mexico, Taos, Bandelier National Park or George O'Keeffe Country. Book a Santa Fe vacation with Two Casitas, and we will do everything we can to assure your trip is a memorable one. Enjoy an introduction to Two Casitas hosted by the owner, Wendy Kapp.